The answer to Gollum’s riddle was of course time. It devours all things. It doesn’t do it quickly, it does it drip by drip like water. Throw water at a rock and it splashes and makes the rock wet. Throw water at a rock every second of every day for a thousand years and the rock becomes sand. The slow steady drip of time wears away at everything. Real-Time data is like watching a river in that respect. It’s watching the steady flow of time and visitors across your site. Ebbing and flowing, changing and reacting. If a standard report in Google Analytics is a table of data presented to you saying “This many cubic feet of water passed us in the past day, including 4 barges, 2 pleasure craft, and an otter.” then a Real-Time report is sitting on a rock watching the river, listening to the sounds. And when things change, you can react quickly. Though they have been introduced in the reports for a few weeks, Google Analytics announced on Tuesday April 16th 2013, the introduction of Real Time Widgets to the Dashboards feature. In all there were four different widgets introduced. Counters: These show the number of active visitors on your site, similar to the prime “Right Now” counter on the Real-Time overview report. The major difference is that you can determine what the dimension is, if any, to be shown under the counter. On the Real-Time Overview report it shows New vs. Returning users. On your widget you can select a different dimension to break out that counter’s numbers from the set 11 dimensions available in all the Real Time Widgets: Campaign, City, Country/Territory, Keyword, Medium, Page, Page Title, Referral Path, Source, Traffic Type, or Visitor Type. Timelines: These show the scrolling pageviews over either the last 30 minutes or last 60 seconds. Geomaps: This will show visits on a map. you can choose to display by country or cities, and drill down your region from a world map down to a national one. 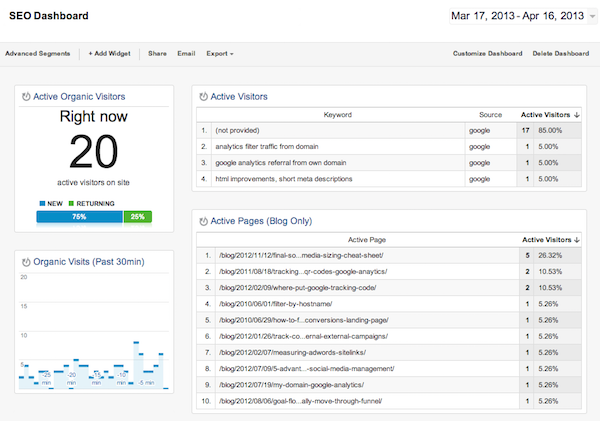 Tables: This shows active visitors, with up to 3 of the dimensions listed above. You can show 5, 10, 15 or 20 rows and you have to option to show percentage bars or not. All these widgets can be filtered on any of those 11 Real-Time Dimensions. Alerts and Intelligence events take time to parse, and sometimes can be a few days before they appear in your Google Analytics account, but Real Time data is what’s coming in as you watch it. It’s how people are using your site right when you’re watching it. This can give, and has given, tremendous insights and opportunities to various companies, particularly when you need to react fast. Example 1: You run a major email marketing campaign, and they start to fly out to the 50,000 people on your email list. The traffic begins, and you watch it mount. Suddenly you notice that they’re only hitting the campaign landing page. Everyone is bouncing. Nobody is clicking on the conversion button. Panic. That leads you to quickly looking at the landing page, and realizing that a last minute addition by someone on the marketing team has broken the page. The conversion button isn’t working. Your developers quickly fix it, and rather than wasting the entire campaign email with no conversions, you’ve only lost a few minutes and a fraction of the visitors who you can now see begin to click on the call to action. Example 2: You keep an eye on your dashboards for spikes of traffic, and notice one day an spike in traffic to a particular older article. You leverage that article and write more on the subject, leveraging that traffic. Instead of missing that spike in traffic entirely lost in the mists of your analytics, you embraced the real time data and increase your traffic 600% (actually happened). I could go on and on and make up scenarios, but the point is that sometimes, for good or bad, you need to know what’s happening right now on your site. Sometimes a report a day or two later on the cubic volume of water won’t cut it. What can a Real Time Dashboard give me that the Real-Time Reports don’t? The standard Real-Time reports are great, but they’re very broad, just like ALL the standard reports, and particularly if you have more traffic, you might be interested in looking at just specific traffic. For instance the default Real-Time Locations report is for the entire world rather than a specific country or region. Real-Time Traffic Sources shows every source and medium, but doesn’t show campaign names. 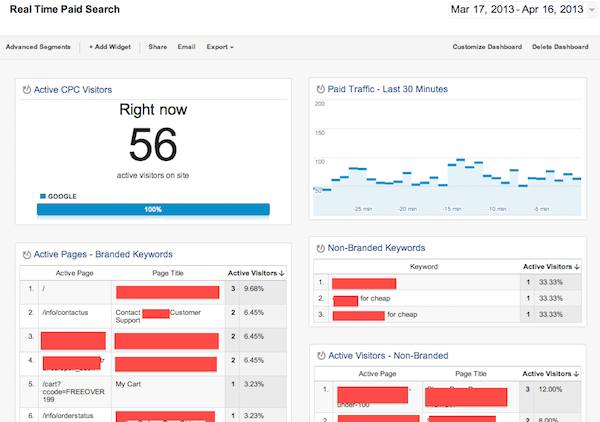 The Top Keywords report on the Real-Time Overview doesn’t filter for branded terms. Real-Time Widgets let you drill down to display immediately the data you want to see. *note: The Geomaps had been working earlier, but when I went to take my screenshots they were having trouble. As this is a new feature I’m not concerned, and I’m sure they will be working again shortly. There are a tremendous number of uses for this feature for real time monitoring of your data. Campaigns, SEO, PPC, Social Media, and more. When I asked both a Paid Search Analyst and the head of our SEO department here at LunaMetrics about these dashboards both said at the end of the conversation “Send me that when you’re done.” which to me was a good indication of the value of Real-Time Widgets on Dashboards. What other kinds of uses can you think of? What would be a great real time dashboard, or dashboard that combines real-time widgets, with standard widgets? Post the dashboards you’d want to use below!